Sick of those smudgy boring whiteboards that stain. Then you can make your own and change the background when you like. To start off with take your picture frame apart and clean the glass both sides with glass cleaner. Make sure you have no fluff on the in side glass as you will be able to see it later. Get the backing board from frame and tape white paper on one side. This is so if you have a fabric which is a bit see through the backing board wont show through. Wrap the fabric of your choice over the backing board. I choose white because when you go to write on the board you can see all of the colors. Pull the fabric tight and tape it down on all sides so it cant move or slip. Next you get get some ribbon and put it on top of the fabric and secure with tape on the other side. 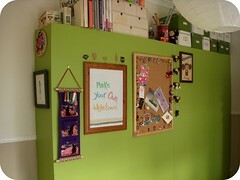 You could also put on pictures anything you like that is not to bulky. Grab your backing board and lower it into the the picture frame sandwiching it in can be quite tricky turn frame over to make sure all is in place and not moved. Then you can secure the backing board in place in the frame and presto all done ready to hang on the wall. 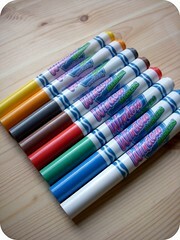 I use crayola white board markers on the glass they have a fine tip and rub off easy and come in great colors. 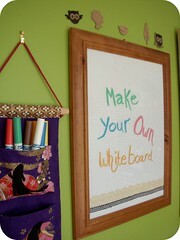 You could also make a version with black fabric and just use a white window marker.